It was the summer of 1915 and the British were desperate. Fighting on the Western Front had degenerated into stalemate. The ditches that separated the opposing forces proved an insurmountable barrier that had transformed the conflict from a war of movement into a deadly battle of attrition. A new fighting vehicle was needed - one that could traverse the cratered moonscape of the Western Front and breach the line of enemy trenches. This would allow the cavalry to pour through the exposed gap and envelop the Germans from behind. What was needed was a tank. testing. Manned by a crew of four, the 30-ton weapon's armament consisted of two cannon mounted on its sides. It lumbered along at three miles an hour. Encased in an unlit steel box, the crew suffered in an atmosphere that was only one step removed from Hell - unbearably hot, dusty, noisy, the air filled with the nauseating stench of gas fumes. The new weapon made its battlefield debut on September 15, 1916 when fifty of the machines joined the Battle of the Somme in a third attempt to attack and break through the German defenses. The attack failed - no breakthrough occurred. Only 35 of the tanks actually took part in the battle. Their presence shocked the enemy, but their practical impact was minimal due to a lack of effective tactics and numerous mechanical failures. But, the door to the future was opened and the first step taken in the development of a weapon that would dominate the battlefield of future wars. "...lumbering slowly towards us came three huge mechanical monsters such as we had never seen before." "We heard strange throbbing noises, and lumbering slowly towards us came three huge mechanical monsters such as we had never seen before. My first impression was that they looked ready to topple on their noses, but their tails and the two little wheels at the back held them down and kept them level. Big metal things they were, with two sets of caterpillar wheels that went right round the body. There was a huge bulge on each side with a door in the bulging part, and machine guns on swivels poked out from either side. The engine, a petrol engine of massive proportions, occupied practically all the inside space. Mounted behind each door was a motor-cycle type of saddle, seat and there was just about enough room left for the belts of ammunition and the drivers. I was attached to battalion headquarters and the colonel, adjutant, sergeant-major and myself with four signallers had come up to the front line. From this position the colonel could see his men leave the assembly trench, move forward with the tanks, jump over us and advance to the enemy trenches. As a new style of attack he thought it would be one of the highlights of the' war. While it was still dark we heard the steady drone of heavy engines and by the time the sun had risen the tanks were approaching our front line, dead on time. The Germans must have heard them too and, although they had no idea what to expect, they promptly laid down a heavy curtain of fire on our front line. This had the effect of making us keep our heads down, but every now and again we felt compelled to pop up and look back to see how the tanks were progressing. It was most heartening to watch their advance, we were almost ready to cheer. But there was a surprise in store for us. Everyone dived for cover, except the colonel. He jumped on top of the parapet, shouting at the top of his voice, "Runner, runner, go tell those tanks to stop firing at once. At once, I say." By now the enemy fire had risen to a crescendo but, giving no thought to his personal safety as he saw the tanks firing on his own men, he ran forward and furiously rained blows with his cane on the side of one of the tanks in an endeavour to attract their attention. Although, what with the sounds of the engines and the firing in such an enclosed space, no one in the tank could hear him, they finally realised they were on the wrong trench and moved on, frightening the Jerries out of their wits and making them scuttle like frightened rabbits. One of the tanks got caught up on a tree stump and never reached their front line and a second had its rear steering wheels shot off and could not guide itself The crew thought it more prudent to stop, so they told us afterwards, rather than to keep going as they felt they might go out of control and run on until they reached Berlin. the tank's entrance into the village of Flers. Bert Chaney's account appears in Moynihan, Michael (ed.) People at War 1914-1918 (1973); Liddell Hart, Basil, The Tanks vol. 1 (1959). 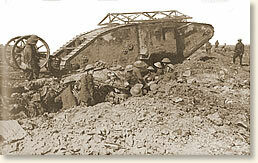 "The Battlefield Debut of the Tank, 1916," EyeWitness to History, www.eyewitnesstohistory.com (2005). The name "tank" came from the secret code word selected to disguise the nature of the weapon's development project - "tank" referring to water tanks.